1. Benefit: Cooling off on a hot summer day. Your pup will most likely thank you for that dip in the pool when he or she has been panting from that sun beating down. Just make sure the pool water is not too cold or it may be a shock to them. 2. Benefit: Provides them with low impact workout. 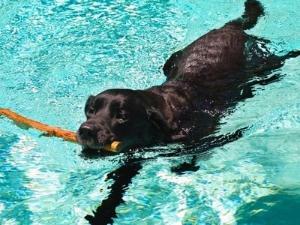 Just as humans do water aerobics for an ease on their joints and muscles, dogs can too! It is a great cardiovascular workout. Just remember to gradually increase the time in the water. Don't let them swim for a long time their first time in even if they prove to be a great swimmer. 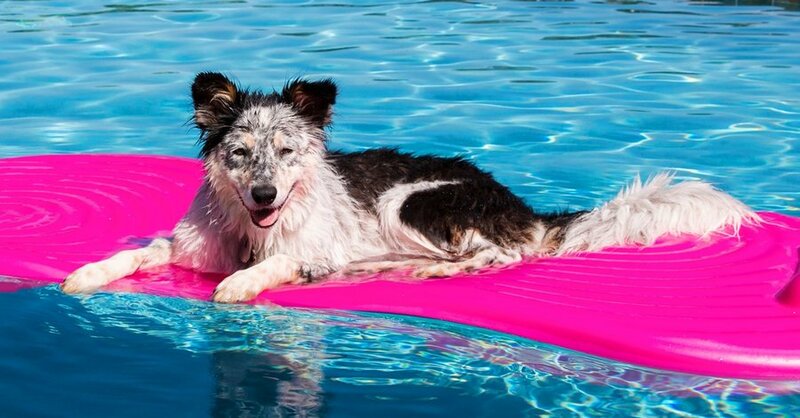 Your dog will most likely enjoy the time with you playing in the pool and will be ready for a nap afterwards! Double bonus! 4. Risk: Making sure your dog can swim. Different dog breeds are good at different things. For example, some dogs known for good swimming habits are english setters, golden retrievers, labs and newfoundlands where other dogs such as bulldogs, pugs and dachshunds are usually not as great of swimmers due to their tiny legs. However, if you are teaching your pug to swim, and they enjoy it, it doesn't mean they can't swim! Just like all humans are not alike, dogs are not all alike either! Please do not ever leave your dog unattended by the pool. 5. Risk: Make sure ALL chemicals are put away. We know dogs love to eat everything in sight! Lastly, it would also be a great idea to give your dog a good rinse with clean water to get any pool chemicals off so they do not irritate their skin. Putting your dogs' safety should be of primary concern!